25. Stop eating things that are bad for you! 1. Pursue a new and different career, be passionate about the work you put into the world; got a new and exciting job, learning a new industry. :) I shoulda done this years ago. 4. Save more money, continue saving more money --> Need to pay off those student loans! 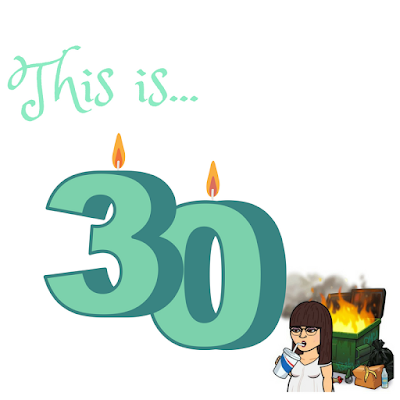 wooo (grown up Karen); doing this, also got rid of hella stuff, material things and trying to become a little more strict and sticking to a budget. 6. More giving back to the community yo! ; I definitely started doing this and I am still working on it. "Many of us are learning to sit perfectly still, to sense the presence of the Soul and commune with Her. We are beginning to realize that we are not wholly at the mercy of circumstance, nor are our lives completely out of our hands. That if we posture as victims we will be victims, that hopelessness is suicide, that self-attacks stop us on our tracks. We are slowly moving past the resistance within, leaving behind the defeated images. We have come to realize that we are not alone in our struggles nor separate nor autonomous but that we - white black straight queer female male - are connected and interdependent. We are each accountable for what is happening down the street, south of the border or across the sea. And those of us who have more of anything: brains, physical strength, political power, spiritual energies, are learning to share them with those that don't have them. We are learning to depend more and more on our own sources for survival, learning not to let the weight of this burden, the bridge, break our backs... Mujeres, a no dejar que el peligro del viaje y la inmensidad del territorio nos asuste - a mirar hacia adelante y abrir paso en el monte (Women, let's not let the danger of the journey and the vastness of the territory scare us - let's look forward and open paths in these woods). Caminante no hay puentes, se hace puentes al andar (Voyager, there are no bridges, one builds them as one walks)." 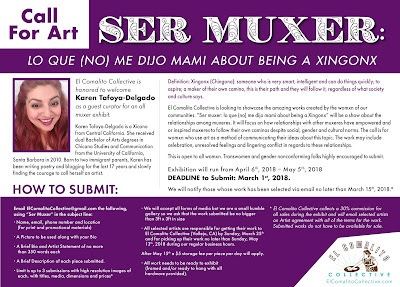 I am really beyond excited for the opportunity to curate Ser Muxer: Lo que (no) me dijo mami about being a Xingonx - THANK YOU El Comalito Collective. The call for art was inspired by the quote above and various relationships throughout my life and how they've either challenged, inspired and empowered me to be the Xingona that I am. 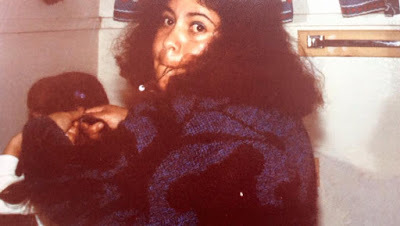 On days that I feel not so Xingona - I remember my mother's own struggle(s) and her wise palabras (words) - "Ponte las pilas" (literal translation: put on your batteries, actual meaning is to wake up and be aware) and "Lista desde chiquita" (literal translation: be ready even if you are young, actual meaning is to be alert now). I truly believe that as muxeres - the relationships we have with one another are the most powerful and at times serve as reinforcement to move forward - fighting, working, being - to be a force. The call for art is intended to generate work that documents and represents these relationships among muxeres as it is especially important for present day and for generations to come. I see relationships as bridges - we build them as we walk through life, they shape us, we shape them - we must be fearless, Xingonas. When I first moved to the bay area in 2012 - I came here looking for community. I came here because as an undergraduate at UCSB - I was so amazed by the murals in my readers and on the screens of power point presentations of my Chican@ Studies classes. I romanticized San Francisco and hoped it was what was described in the 70s and 80s. 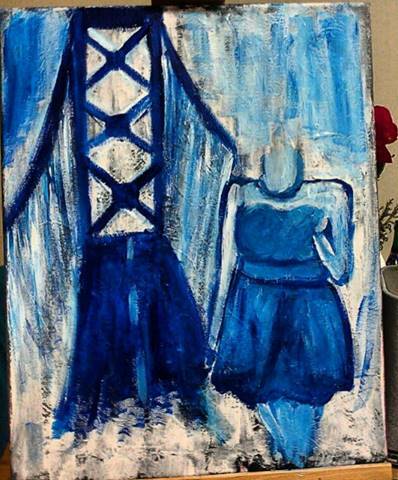 I am still looking to build bridges. I think they kinda have always been - I'm not sure. Don't get me wrong - I love the idea of having designated days off of work - but the whole social construct of things and commercial/capitalization is what bothers me. I understand and value having time to spend with family - I really do - maybe I am jaded because of how holidays have been since 2012 and I can't shake it - perhaps I have become the Grinch - I don't know. The Holidays are weird because they are hard. In 2012 - I ditched my family for the first time and spent the time with my significant other's family. In 2013, my mom ditched us and went to go visit my brother Hector in Mexico - which makes sense since he is out there in Mexico without family. And well in 2014 she passed away - so Holidays just were not the same. I always told myself that I would eat tamales next time she made some - or that she would just save me some in the freezer - but then time passed and nothing was as I expected it to be, and I took that time for granted - it's part of the guilt I carry and I don't know how I will let that go. And her birthday falls right in the middle of Thanksgiving and Christmas. This is year four. As a family we have to pull it together - for each other and for my dad and for her. We spend time together, eating food that will never taste as good as hers, missing her and trying to keep it together. She would probably laugh at me and tell me to stop exhausting myself, overthinking what to make and how to manage to get from point A to point B back to point A in less than 24 hours to ensure that time with family is spent regardless of the 100 miles in between. She would tell me to stop being such a crybaby and to stop talking so much about her - she would say "hay Ester, you are so annoying" - HA. I wish we could replicate her tamales. Today is Dia de los Muertos - no it is not "Mexican Halloween"
I can go into detail about what it is and how it came about but that is not what I intended this post to be. This post is about why and how I started celebrating this day. Although I am Mexican-American and the daughter of Catholic Mexican immigrants it was not my parents who introduced me to this day - nor the celebration and remembrance of those who have physically left this earth/life. I was 15 - trying to figure myself out - in high school - with my eyes on my future; building up what would get me into college. I made sure to take all the classes I needed, get good grades, join clubs - play volleyball, etc. There was a new club - Hispanic Youth Leadership Council - I figured sure - I can be apart of this - regardless how I eventually came to feel about the word Hispanic (I promise to write about this whole concept one day). SO I joined this club; there were a lot cool events we got to be apart of - some students even got to do this lip sync contest - I am not coordinated enough so that wasn't the route I took. Here is where I was introduced to Dia de los Muertos - there was a contest somewhere either in Modesto or nearby that I decided I wanted to be a part of - myself along with other students and some staff built an altar dedicated to Mexican singer-songwriter Jose Alfredo Jimenez Sandoval. I enjoyed learning about the history and the traditional elements that were in the altar as well as learning about this singer-songwriter and his influence on Mexican music - and more importantly how he left a legacy and continued to live on. I continued to build altars dedicated to Mexican/Latino Icons after that - then I went to college, ah Santa Barbara; alone, with no one I knew for 300 miles. I found flyer that read, "Dia de los Muertos brought to you by the Chican@ Studies department" - at that time I had no idea what being Chicana/o was - I was cool calling myself Hispanic/Latina...it was at this event that I found community at UCSB, where I decided I would double major in Chican@ Studies and that I would not transfer. Fast foward to 2012 - I moved to Oakland, again - not knowing many people - but now at least I was less than a 100 miles from home. I began building my altars and with the help/opportunity from a friend I was able to volunteer at local high schools and bring that same experience I had in high school to others. It has become our family tradition to visit her grave on this day and build her a mini altar/take her an offering. 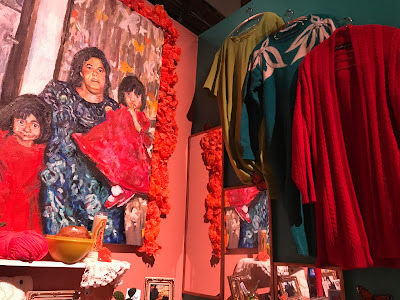 This year, 2017, was very special - I was able to participate in the SOMArts - Dia de los Muertos exhibition - http://www.somarts.org/remembrance/ - with the help of my husband and niece, I was able to build and dedicate a public altar to my mother. I never thought that this day would become this important to me - but it has. In a way it has help me cope with the idea that she is not physically here - but she lives on through her legacy and us. I am on my way to pick up my dad now to visit my mother and then I will be building nichos with my nieces. If you haven't already checked out the exhibit at SOMArts - please do so - it is up until next Thursday, November 9th, 2017. Here is the Facebook Event Invite - please check it out! thank you. Hay días que me siento tan sola. Hay días en que siento que hay bastante gente, pero no son mi gente y la verdad es que no le tengo confianza a nadie. Me perdi, ya ni se quien soy - ni quien quiero ser - solo se que te estraño. My problems are 1st world problems. I'm sad, I am not dying, I am not starving - I don't think I've ever really struggled in my life - things could be a lot worse. I need to learn how to appreciate my life and be grateful for everything that I have. I tell myself that I am not trying hard enough; I don't know if I will ever be happy - but I don't know that I ever knew what it was to be happy before everything. I think that for the last few years I've let your death define me and my sadness, my anger; I don't know or think that that's okay. I've made my attempts to overcome it - and failed and tried again. Throughout this process I've overheard and been told that I need to get over it. I've even been told that it shouldn't be this big of a deal - I'm angry - at everyone that has negative things to say about me being sad - I get that they may not understand - and my heart is not big enough to try to understand them - I never wish this type of loss on anyone - and until they experience it (because life is not forever) then they will understand. I feel ugly most days, I want to stay inside and away from everyone. I feel guilty because I don't love myself as much as before and I feel like I've broken so many promises I made myself. I feel like a soda that someone dropped then picked up and shook and I've been bottling up all this anger, emotions and I might explode - what if I go crazy? Could a crazy person reason with their own logic about all their emotions? is that what defines a crazy person. I pray - but only to ask to be graced with instances that remind me of you and that your spirit shows up randomly. When I run into Mexican women your age, dressed similarly to what you'd wear and they smile at me - I know it is you and it makes my day better. 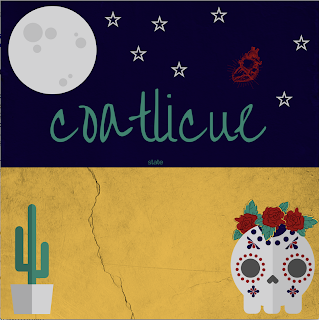 I feel like I am about to start something new - remember about that time I told you about death and rebirth - and how during our lives we are constantly dying and being reborn - I am entering coatlicue state. 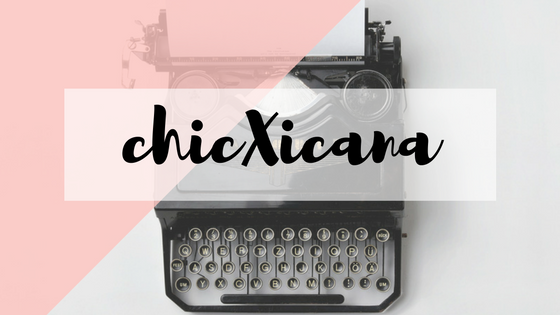 COPYRIGHT © 2016 chicXicana. Simple theme. Powered by Blogger.